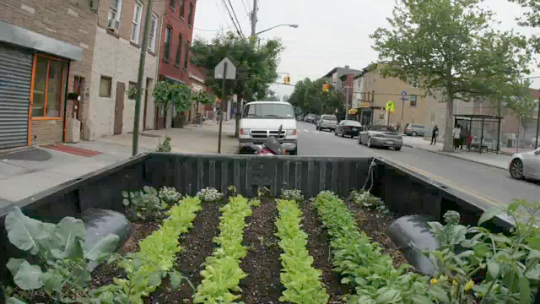 Curt Ellis and Ian Cheney, the filmmakers behind the documentary King Corn, are working on a new film / art project "Truck Farm," a living, mobile garden inside the bed of a 1986 Dodge half-ton pickup truck, parked on the streets of Brooklyn. It's a mobile CSA — with twelve paying subscribers — growing tomatoes, broccoli, arugula, and parsley. Over at Civil Eats, Curt Ellis described the project: "I like to think that the project’s curb appeal goes beyond its novelty... our veggie truck wasn’t meant to be a model for any larger fleet of four-wheeled farmland (though a conversion craze might be Detroit’s last hope). We wanted it to be a showcase for urban agriculture of the low-carbon variety." They're using a solar-powered time-lapse camera to document the project, and will be posting video excerpts throughout the summer, which will eventually be released as a short film on DVD. The truck, however, is turning out to be more popular than the filmmakers themselves. Ellis writes: "Truck Farm is getting invited to way more summer barbecues than its owners." love it. with parking in some neighborhoods you may have to drive your farm around the block a few times. I want a red wagon farm that I can take for long walks in the rain.